At the D23 Expo 2017, Walt Disney Parks and Resorts Chairman Bob Chapek revealed a detailed scale model of Star Wars: Galaxy’s Edge, the Star Wars-themed lands slated for Walt Disney World in Florida and Disneyland in California. Since then, we’ve gotten enough intel about the upcoming expansions to fill the Millennium Falcon‘s cargo hold — including, at long last, when the parks will open (spoiler alert: it’s sooner than you think). From the story to its cuisine to a spin-off hotel that promises to put you in a galaxy far, far away, here is everything that we know about Star Wars: Galaxy’s Edge. After years of teases, Star Wars: Galaxy’s Edge is almost here. In fact, Black Spire Outpost is opening its hangar bay to tourists even earlier than expected. 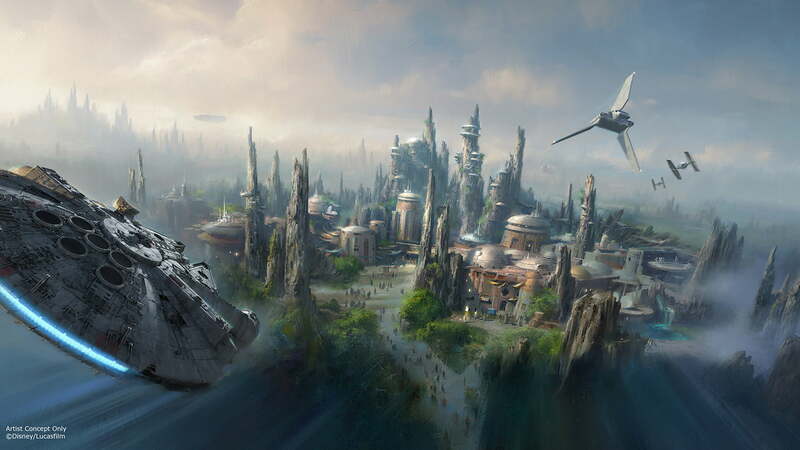 The Star Wars-themed park will launch at Southern California’s Disneyland Resort on May 31, 2019, while the Florida-based edition at Disney’s Hollywood Studios will open on August 29. Early visitors won’t get the entire Galaxy’s Edge experience, however. While all of the shops, restaurants, and costumed characters will be available for guests to enjoy on opening day, Galaxy’s Edge’s two big attractions will launch in stages. Millennium Falcon: Smuggler’s Run will be up and running on opening day, but Star Wars: Rise of the Resistance won’t be ready for guests until sometime later in 2019. Disney expects Star Wars: Galaxy’s Edge to be extremely popular, and it’s taking a few steps to deal with crowds that potential visitors should be aware of. For the first month, Galaxy’s Edge will only be available to guests who make free reservations in advance (more information on how to do that is on its way). 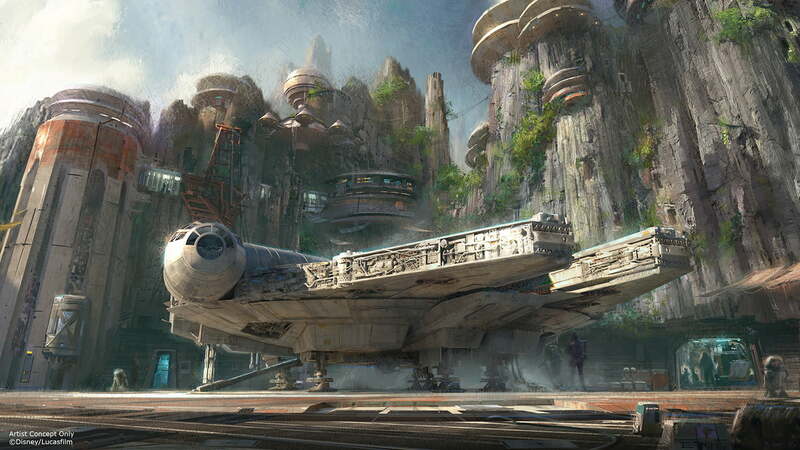 In addition, Millennium Falcon: Smuggler’s Run will not initially be part of Disney’s FastPass system. In other words? Get ready to wait in line. Star Wars: Galaxy’s Edge may be based on science fiction’s most popular universe, but the expansion is set on an entirely new planet. It’s called Batuu, and it’s been described as an outer-rim frontier town and trading port that’s occupied by people — and aliens — of all stripes, including those of the scum-and-villainy variety. Guests can plan on spending plenty of time on the planet — specifically Batuu’s largest settlement, Black Spire Outpost — as the 14-acre area represents the parks’ largest single-themed land expansion. The land will include a cantina, complete with Star Wars-themed food and beverages and extraterrestrial patrons. At Black Spire Outpost, fans can look forward to hanging out in spots similar to the Mos Eisley spaceport or Maz Kanata’s castle. The land will include a cantina, complete with Star Wars-inspired food and beverages, as well as new and familiar characters and extraterrestrial patrons. BB-8, Chewbacca, and Kylo Ren are among the iconic characters guests will interact with. Droids will roam the park, and while there’s no word on whether or not “their kind” will be served at the local watering hole, Star Tours’ former droid host Rex will serve as the cantina’s DJ. Star Wars: Galaxy’s Edge will host two separate rides in addition to a number of themed stores and restaurants. Even better, it’s all canon, and takes place sometime during the new Star Wars trilogy, which began with 2015’s The Force Awakens and wraps up in 2019’s Star Wars: Episode IX. Early press reports prove that Iger wasn’t kidding around. In February 2019, select members of the press got their first look at Galaxy’s Edge, and got to sample some of Batuu’s wares. Local food stalls will hawk Star Wars-themed delicacies like Fried Endorian Tip-Yip (think fancy chicken nuggets) and Kaadu Sticky Ribs, which will evoke alien cuisine by combining unexpected ingredients to create unusual flavor combinations. At Oga’s Cantina, guests can sample Star Wars’ infamous blue milk, mocktails like Tatooine Sunset, and alcoholic concoctions like the Bespin Fizz, the Outer Rim, and a selection of custom-brewed beers. Yes, that’s right: at Star Wars: Galaxy’s Edge regular Disneyland guests will be able to drink booze at the park. Plan your day accordingly. All of Star Wars: Galaxy Edge’s merchandise will be similarly in-theme. Don’t expect to find see action figures, DVDs, or regular old T-shirts lying around. Instead, you’ll be able to pick up toys with a handcrafted look inspired by the doll that Rey keeps in her Jakku shelter in The Force Awakens, robes and other cosplay-like outfits, and collectibles masquerading as old Jedi antiquities. Even if you’re not buying anything, the stores have been designed to be fun to visit, with animatronic characters running the shops and all kinds of small details hidden away for lore-hungry Star Wars fans. If you’ve got a bunch of credits (or dollars) to spare, Star Wars: Galaxy’s Edge also has a couple of premium items that you can spend your money on, both of which will help make your park-going experience even more immersive. To start, anyone who stops at Savi’s Workshop will be able to build their own lightsaber, Jedi-style, in an interactive 15-minute shopping experience. Customers will select their saber’s hilt, its blade, and its kyber crystal (which determines the lightsaber’s color). Like the wands at Universal Studios’ The Wizarding World of Harry Potter, the lightsabers are expected to interact with various Star Wars: Galaxy’s Edge attractions, although it’s not yet clear exactly how that will work. We do know that lightsabers won’t come cheap: a hilt costs $109 and blades come in at $50, making a custom-made Jedi weapon more expensive than the park ticket itself. Anyone who wants some company while browsing Galaxy’s Edge can also visit the Droid Depot, where guests can design their own R2-D2 or BB-8 style robots. It’s essentially a high-tech Build-a-Bear. The little remote-controlled droids won’t just follow you around while you browse the park, either. While you’re at Galaxy’s Edge, the droids will talk to each other as well as Black Spire Outpost’s permanent residents, making the whole experience even more immersive. Disney hasn’t announced how much the custom droids will cost, but given how expensive the lightsabers are, we’re going to guess that they’ll be pretty darn expensive. One of Star Wars: Galaxy’s Edge’s premier attractions will place parkgoers in the cockpit of the Millennium Falcon. Riders will embark on what’s being called a “secret mission” that will play out differently based on their actions and choices. Your performance will also follow you around the park, possibly earning you accolades (and credits) for a successful flight or a bounty on your head for a less-than-stellar spin around the galaxy. While details on the experience are locked down tighter than Luke Skywalker’s location, reports say that guests will assume different roles on the ship and that they’ll need to work together to make sure that the Falcon’s mission is a success. The ability to actually pilot the ship sounds similar to parts of current Disney park attractions Star Tours and Mission: SPACE. A full-size replica of the Millennium Falcon will be permanently parked in Galaxy’s Edge, too, giving visitors a familiar landmark on this otherwise alien world. No word on whether or not we’ll be able to challenge Han Solo’s Kessel Run record, but any attraction that puts us in a seat once occupied by Chewbacca is worth lining up for. Rumors suggest that Rise of the Resistance will be a prison-break story that takes place after park attendees board ships departing Batuu, only to get captured by the First Order. A rogue droid will reportedly help guests break free, and then the chase is on. Rise of the Resistance riders must dodge attacks from life-size AT-AT walkers, and avoid Kylo Ren, who will make multiple appearances in the attraction, in order to buy time for a daring rescue from Resistance forces. Right now, this is mostly hearsay, but given that Rise of the Resistance was code-named “Alcatraz” during development, it seems like the rumored storyline probably has at least a little bit of juice behind it. In a video released earlier this year, Disney confirmed it was constructing at least two AT-AT walkers. The tease shows the mechanical beasts’ metal husks at a construction site before one of the finished products turns its head and unleashes laser fire on viewers. A towering AT-AT has flanked the Star Tours attraction in Disney’s Hollywood Studios in Orlando, Florida, for years, occasionally squirting passers-by with water, but mostly serving as an awesome photo opp. We’re guessing these new additions might play a more active — and possibly nefarious role — in the new expansion. Another of the expansion’s signature attractions is being billed as “an epic Star Wars adventure that puts you right in the middle of a climactic battle between the First Order and the Resistance, where guests will feel like they are inside a hangar bay on a Star Destroyer.” While you’d have an easier time grooming a Wookiee than learning specifics on this promising E-ticket experience, we know it will tie into the larger themed narrative. To that same point, park guests will be able to build a reputation in Galaxy’s Edge based on their experiences and decisions throughout their visit. We’re not exactly sure how all this will play out, but we suggest not ordering a blue milk at the cantina unless you want to be pegged a whiny moisture farmer. In addition to Galaxy’s Edge, Disney is also working on a Star Wars-themed resort. The ambitious project, being called the parks’ “most experiential concept ever,” was described as “dedicated entirely to the galaxy of Star Wars … a one-of-a-kind experience where a luxury resort meets a multiday adventure in a galaxy far, far away.” While details are scarce, the concept art suggests an unparalleled level of theme-ing and immersion, including uniforms for guests and window views of space. If you’re heading to Disney parks before Galaxy’s Edge opens, you can still check out a number of other Star Wars experiences. Walt Disney World and Disneyland both have a Star Wars Launch Bay, Star Tours – The Adventures Continue, and Star Wars: Path of the Jedi attractions. Star Wars: A Galactic Spectacular, Star Wars: A Galaxy Far, Far Away, March of the First Order, and Star Wars Guided Tours are only available at Walt Disney World. Updated March 7, 2019: Added opening dates, as well as lots of new information regarding food, drinks, merchandise, and rides.